When a dog is chasing after you, whistle for him. Last year a foolish monk. How do you tell the difference between a member of the Boomer generation and someone from the generation just before? Here's one way: ask if there's a preference toward a trumpet or an electric guitar. If you're a boy 16 or 17 in many cultures, you like things loud and fast. Boomers love a couple guys on stage with amplified guitars let out full. Whatever the generation that came before them is called prefers a trumpet section in a band, no microphone needed. Both sounds make your hair stand on end and are wonderful, but most Boomers seem to have let the wind instruments lapse into near extinction. Anyone who knows the name Maynard Ferguson probably can tell you what it was like the first time you heard him...and maybe what the song was. For me it was a feature for him, arranged by Shorty Rogers, of the Bob Haggart-Johnny Mercer ballad "What's New." Joe Rico played it on the radio nearly every day out of that little AM station in Niagara Falls. I remember going downtown to the Music Box record shop (I must have been 12 or 13) and plunking down my 50 cents for a 45 rpm recording of it. (The other side was terrible: "The Hot Canary".) It featured a range of the trumpet previously considered impossible on just one instrument. Maynard played low down into a trombone sound...and then all the way up within seconds to an octave and a half above high C, where generally flutes take over. The arrangement started slow, then changed tempo to way up, finishing off with Maynard pasting notes higher and higher until he nailed that last one that made people gasp throughout his 60 year career of doing it. At the time Maynard (we always called him by his first name) was the high note man with the Stan Kenton Orchestra...but he was just about to leave along with over half the band for adventures on the West Coast. Us guys didn't find that out for a while, and so in the meantime we started collecting all the Kenton records we could find. We thought every high trumpet on them must be Maynard. Capitol put out records then without any dates on them, so little did we know we were listening to Kenton from 10 years earlier when Chico Alvarez, also from Montreal by the way, may have been the guy. Didn't matter though: we were getting turned on to some of the most radical orchestral music (and loudest) of the 20th Century. Soon Joe was playing another Maynard feature he had recorded at a concert at Cornell by Kenton's Innovation Orchestra, which consisted of nearly a hundred players including full string section. This unit toured the whole United States TWICE...before caving in to financial reality of the early 1950s. 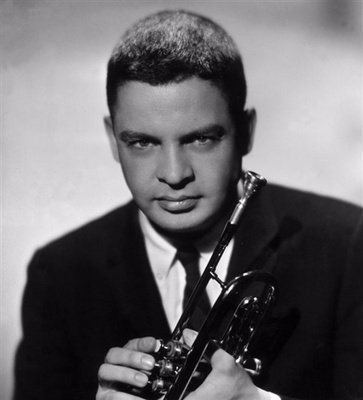 The feature was called simply "Maynard Ferguson" and was composed by Shorty Rogers. The thing lasted 5 minutes and clearly was death-defying for any trumpet man. Maynard made it sound simple, scrambling, swinging, screeching over that instrument. It was available around 1951 or '52 on a 10 inch LP, which eventually I got, but since Joe Rico played this live recording of it we came to understand these incredible players did this music every night somewhere! Since Kenton's death, at least a half dozen such recorded concerts have been found and released...and you can hear Maynard do it literally night after night. I saw the man a few times and I think I've heard nearly everything that got recorded of the Kenton band when Maynard was in it: I never heard him fluff a note. I know he must have, but I never heard it. How did he do it? That's what we teenage boys wanted to find out, particularly Tony Cusimano and Gerry Gullo who played trumpet themselves. By the time we were 16 and 17, Maynard had gotten lured out of the sound studios of Hollywood and back onto the road, this time with his own band. He was only 30, but believed in the philosophy of attracting younger players and arrangers with new ideas. There are recordings of his first band in its formative stages but I consider the first record to be "A Message From Newport," on Roulette which I think was released in late 1958. We already had seen this band twice in my hometown. The album and the band were absolutely staggering. For one thing, when he came to Jamestown, he played at a joint called the Fairmount Grill. The place had a bit of a dance floor and a bandstand...but everything had been designed with a little country & western outfit in mind I think. Maynard carried 13 men, and they were crammed up there so close they had to be careful not to finger the other guy's horn! The sound of 4 trumpets, Maynard out front, 2 trombones (Don Sebesky and Slide Hampton, by the way), the "angry" alto of Jimmy Ford, 2 tenors and a baritone, and a full rhythm section of John Bunch, Jimmy Rowser, and Jake Hanna was enough to blow us up against the wall opposite side of the room---which of course was the bar. (The owner would serve us at 17, but I assure you one beer on the table lasted the night.) Almost all of the compositions and charts were by guys in the band. Maynard stood out in front of that band like a cheerleader/drillsergeant somehow combined. He was constantly on the move to the rhythm. He must have been in a marching band around his home of Montreal when he was a kid, because he liked to tuck his horn under his arm and just march up there while the ensemble played away. A huge smile on his face and eyes closed, marching, marching, a bit hunched over...until time for that closing climax, when he'd face us and let loose with such a screaming, molten sound, our jaws would drop and stay that way. He loved to talk to us during breaks and gave us all the time we wanted. Tony finally asked him the question: how the hell does he do it? Critics had been saying for years that Maynard had some kind of freak lip and wouldn't last. Maynard gave the grin that earned him the nickname The Fox and said, "Well Tony, what I do is plant both feet solid on the floor. That high note comes from there. I feel it out of the floor, through my feet, and with tons of breath, I blow that thing out of the horn." Later Tony said to me, "You hear that? He doesn't reach for it. It comes up out of him." Maynard Ferguson was the most dependable workhorse I think I ever saw in music, particularly jazz. He was there on time and no matter how old he got...and how disappointing eventually his music had to be for me, he kept going. When nobody else in the world had a traveling jazz band (or whatever it was called after "Rocky" and "Star Trek" and other hits he managed to achieve) Maynard still went. Sometimes there were just a few guys with him, but the arrangements were the same...and he'd bring in synthesized keyboards to make more sound. The other day Maynard died at age 78. The New York Times obit tells us his last words were an urgent plea to let him get back on the road. Another tour, in which he would ride the bus like always with the sidemen, was scheduled in a couple weeks. Still the sound of Maynard The Fox rings in my ears. It came up from the floor. Beautiful. Yeah, he was one of the greats. Beautiful in memoria for dear Maynard. And you're so right; "Message from Newport" is indeed one of the best big band LPs ever recorded and possibly Maynard's best (though "Boy with a lot of Brass" for Emarcy is up there). The guy's horn had all the ego; the man himself was as humble as can be. He was the coolest of the squares, with the possible exception of Bill Evans, Paul Desmond and Wes Montgomery. O wow, jazz fans are as bad as baseball guys for making categories like Marc's up there. It's impossible to stop your head from racing into "Let's see, what other 'cool squares' can I think of?" I don't know your age, buddy, but John Wilson and Ed Beach used to have jazz radio shows in New York with categories. I used to wonder When is anybody going to do a feature on left-handed trombone players?! Watch: Marc'll have to write back and name one. Since writing this reminiscence, jazzoLOG has been honored with a reference at Doug Ramsey's Rifftides. If you have an interest in jazz, that's a site you might want to check out every day. and I too look in here once in a while, auspiciously today with you here. Mostly I just come in to clear away the UGGs at the site. Otherwise I like seeing you at the other gathering place...which will remain anonymous.